This had so much potential and it never materialized into anything. That is the intense tragedy of Scythe. 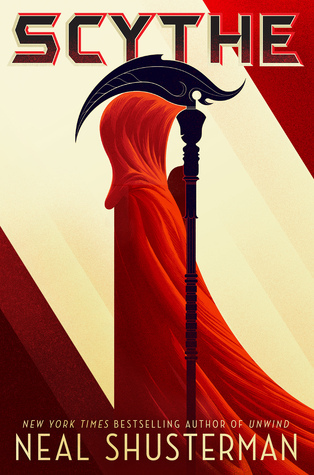 It is a novel with an interesting premise: the world has grown so advanced that no one dies anymore and Scythes are tasked with killing people in an ordered, systematic way. The characters in this interesting world were completely flat. Citra and Rowan were selected to be Scythes in training. They both don’t want this job. Which is a good thing, you shouldn’t want to be a killer. But, they had no feelings. They weren’t grappling with big decisions. They were just there. It sucked the life out of this interesting premise to have two so very vanilla characters. The worldbuilding was overdone. This was a long read and it was almost entirely worldbuilding. Which would have been fine except there was nothing else going on in the story. The characters were pawns with little to no personality. The one thing I did enjoy about this story was that it spanned multiple generations of characters and ideological viewpoints. It was really about internal power struggles in organizations that are immune from law. I enjoyed that aspect but the story read as rather dry. I was expecting something with more zest and this wasn’t it. Overall, this was so-so read. It had tons of promise that never materialized. I don’t plan on continuing this series, there just wasn’t enough to keep my attention.